I’ve got a new styling video up of how I do my long fluffy puff! I did this style on day 3 of a Wash-N-Go and my hair was a little frizzy and dry so I needed to first remoisturize it by applying water, leave-in conditioner and to seal a little oil. After moisturizing I separate a section of hair at the front with a hair bubble because I will style that section last. I then apply a little gel to the edges of my sides and brush them back gently. I repeat the gel, brush, and pin routine on the other side. I then style the front by first spritzing a little water, adding a little gel, brushing the edges. I like to give myself a little “pompadou” or bump at the front and then pin the hair down. I like to fluff my hair out to make it bigger and then fix areas that need fixing. What do you think? How do you make your fluffy puff or Afro puff? Would love to hear from you! 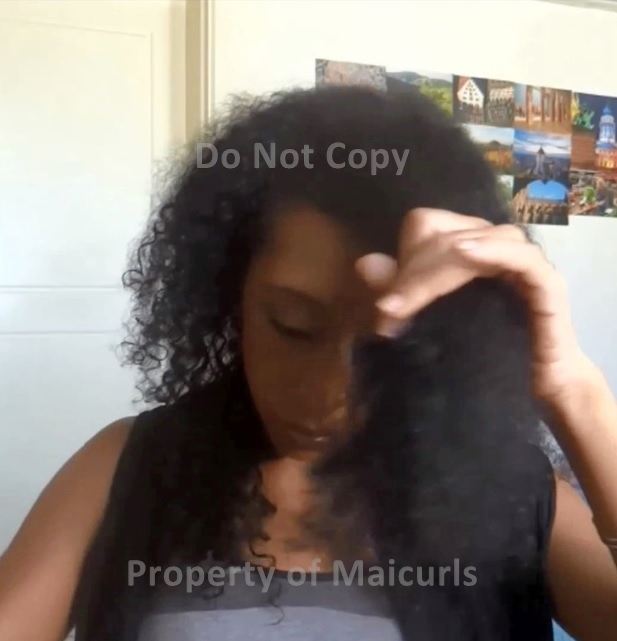 This entry was posted in DIY Creamy Leave-In, DIY Leave-In Conditioner, DIY Mixed Sealing Oil, Flax seed Gel, FSG, moisturizing hair and tagged DIY Creamy Leave-In Conditioner, DIY Leave-In Conditioner, DIY Mixed Sealing Oil, Fluffy puff on August 2, 2014 by Maicurls. I figured it was time to do a other styling tutorial seeing as I have been on a DIY and experiment frenzy as of late. This is my Twist and Tuck Donut Bun. I love this bun because it is oh so easy to do, really quick and more importantly it is a protective style. Apart from being a protective style it does not require a lot of manipulation and if you do not make it too tight you can actually just cover your hair at night with a scarf, take down the scarf in the morning , touch up the edges (if you wish) and you are good to go! I have a video of how I do my Twist and Tuck Donut Bun on YouTube. 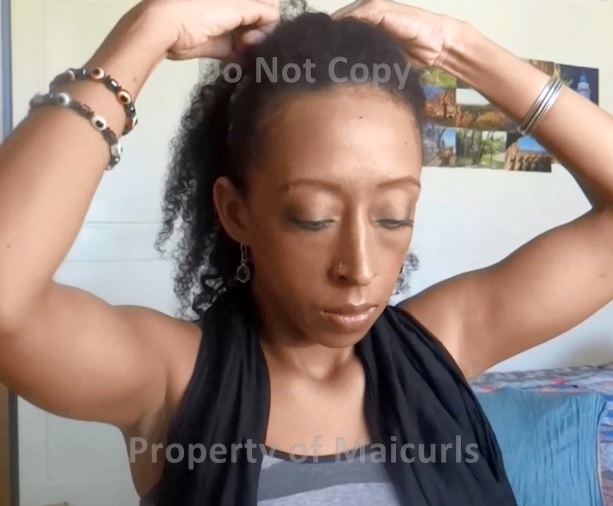 This entry was posted in Accessories, Accessorizing a protective style, Buns, DIY Creamy Leave-In, Donut Bun, Protective Style and tagged accessorizing protective styles, Bun, DIY Leave-In Conditioner, Donut Bun, Protective Style on May 13, 2014 by Maicurls. Right, now that that’s out of the way let’s get down to business shall we. This will be my first “product review” if you can call it that, so please bear with me (it is long)! I wanted to provide as much information as possible. I had to change my “go to” conditioner because long story short I noticed an ingredient that was either newly added or I never noticed it in the list before. I will not mention the name of the conditioner but the ingredient is Paraffinium Liquidium!!! (Mineral Oil!) Said conditioner was my staple for a number of reasons. It is paraben, silicone and phenoxyethanol free, contains 98% ingredients of natural origin and has a gentle pH. Aside from that it contains Shea Butter and Olive Oil, detangles my hair and deeply nourishes it. So Why?? Why?? WHHHY??? I do not get it! You go to the lengths of being all of the above and then have that in there?!?! I was even a fan of the Hair Mask/Deep Conditioner from said company. Ok enough of my rant. This brings me to my product review of TRESemmé Naturals. This is an old friend from back when I was transitioning and even after I was initially fully natural. I think during my product junkie days I sort of forgot about this conditioner. So I revisited my longtime friend and like it! I went over some product reviews to see what other natural-heads had to say before I retried it and of course there are two sides to every coin. There are rave reviews and some who were not too fond of it. Apparently at some point the ingredient list had been changed without warning and this caused quite a stir! Some ladies said that they preferred the “old” conditioner better. For me, I remember being fond of it a few years ago and my hair still responds well to it. 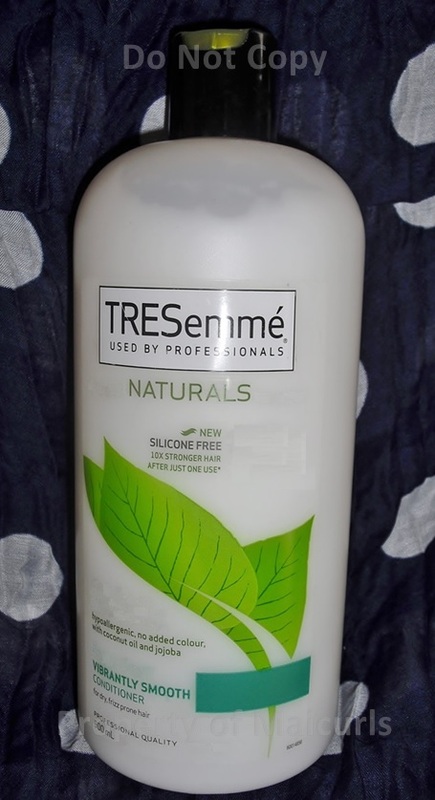 Before you continue reading please note: while the name says TRESemme Naturals it is NOT 100% natural! So ladies/gents please read your ingredient lists and then read it again to familiarize yourself with the product and to know what you are applying all over your hair and scalp. I tried both the: Vibrantly Smooth Conditioner and the Moisturizing Conditioner over a few weeks to get realistic results. I used both in the same way I used my previous conditioner: to wash/co-wash, as part of my DIY Deep Conditioners (DC) and my DIY Leave-In Conditioners. 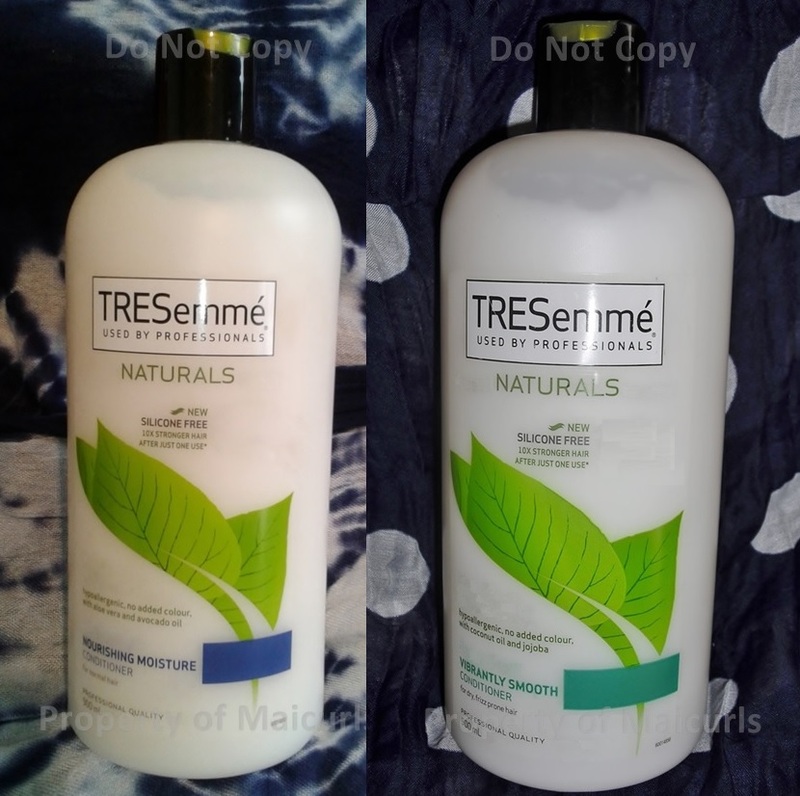 Both bottles have a clean and simple design with a big green leaf and a description of what each conditioner is supposed to do for your hair at the front. The back of course gives more details. The bottles are quite large (900ml) which is both positive and negative because while you get A LOT of conditioner the bottles are a little “bulky” in case you want to take one with you on vacation. 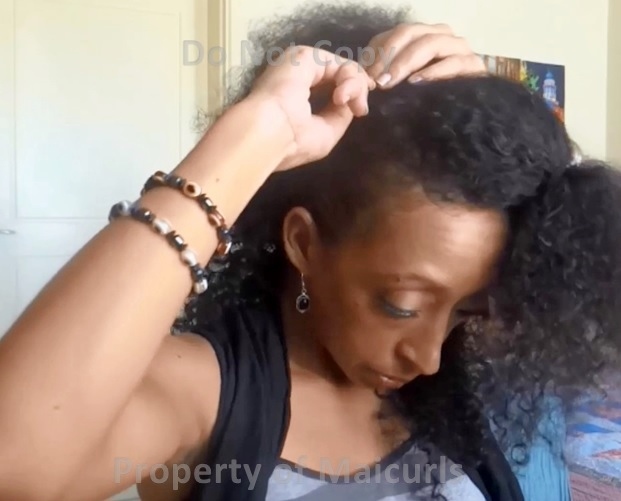 *Read my Curly Travel Tips post to see how I solve this issue when I travel. Both conditioners are the same price (in my area) and both are affordable (again in my area) so when it comes to price I think you get your monies worth especially as they are large bottles. *Price depends on where you live in the world but from what I have read online it is a seemingly cheap conditioner worldwide. They are both reasonably thick (not to the point that it is hard to squeeze them out of the bottle) and give me great slip. The color of the conditioners is white, the scent of both are neither strong nor overpowering but they do have a light ‘perfume-ish’ smell. F.Y.I they both contain (PARFUM) fragrance (ingredient list below) in case this is an issue for you. Moisturizing Conditioner: My hair really does feel moisturized after using the conditioner as a co-wash/DC/Leave-In Conditioner. It cleans my hair but does strip it (technically a conditioner should not but there have been cases of this happening). As part of my DIY DC’s I enjoyed the results because it left my hair feeling moisturized and soft. Since it was not developed as a DC I add additional ingredients for more benefits. My hair does not feel or look weighed down when used as a Leave-In nor does it coat my hair. Instead, I get really moisturized curls with a nice sheen, good clumpage, curls that pop and are really shiny. Note: when used as a DIY Leave-In the ratio of the ingredients used can determine if you do/do not get buildup. Therefore make sure to use measured amounts and ration the amounts used. Vibrantly Smooth: My hair feels moisturized, slick (not greasy) and not stripped at all. My hair does not feel or look weighed down instead, it does a good job of clumping my curls, moisturizes my hair and giving it a smooth finish. As part of my DIY DC’s I enjoyed the results because it again left my hair feeling moisturized and soft. Since it was not developed as a DC I add additional ingredients to maximize the results. I noticed the most frizz reduction when I use it as a part of my DIY Leave-In Conditioner. Note: when used as a DIY Leave-In the ratio of the ingredients used will determine if you feel like you have buildup or not. Therefore make sure to use measured amount and ration the amounts used so not to cause buildup or clogged scalp pores. Moisturizing Conditioner – Water (Aqua), Caprylic/Capric Triglyrceride, Cetyl Alcohol, Stearyl Alcohol, Stearamidopropyl Diemthlyamine, Aspartic Acid, Lauroyl Lysine, Persea Gratissima (Avocado) Oil, Aloe Barbadensis Leaf Extract, Caprylyl Glycol,Brassica Campestris/Aleurites Fordi Oil Copolymer, Distearyldimonium Chloride, Citric Acid, Ethyl Alcohol, Isopropyl Alcohol, Parfum (Fragrance), Benzyl Alcohol. Vibrantly Smooth Conditioner – Water (Aqua), Cetyl Alcohol, Stearyl Alcohol, Caprylic/Capric Triglyrceride, Stearamidopropyl Diemthlyamine, Lauroyl Lysine, Aspartic Acid, Cocos Nucifera (Coconut)Oil, Simmondsia Chinensis (Jojoba) Leaf Extract, Ethyl Alcohol, Caprylyl Glycol, Brassica Campestris/Aleurites Fordi Oil Copolymer, Distearyldimonium Chloride, Isopropyl Alcohol,Benzyl Alcohol, Citric Acid, Parfum (Fragrance). NOTE: when looking at ingredient lists sometimes we get confused about the alcohols in them and think all alcohols are “bad” when that is not always the case. Examples of “good” alcohols are fatty alcohols such as: Cetyl Alcohol & Stearyl Alcohol. Benzyl Alcohol is considered more of an “average” alcohol, whereas alcohols such as: Ethyl Alcohol & Isopropyl Alcohol are “poor” alcohols as they can cause the hair to feel dry. Therefore if your product contains “poor” alcohols try to make sure they are at the bottom of the list as this indicates there is a low percentage of it present. (The higher up an ingredient is listed the more prevalent it is in the product.) Also make sure to do patch tests before you apply conditioner all over your head. In all honesty I really like both products but I would say the Moisturizing Conditioner is my favorite because it does what the label says! It makes my hair feel great, cleans yet still leaves it moisturized and really really soft. I will never have frizz free hair (I am not looking for that It) and the Moisturizing Conditioner seems to give me just that extra moisture. Also since I am an ingredient fanatic I prefer its ingredient list over the Vibrantly Smooth Conditioner since all of the “poor” ingredients are listed right at the bottom of the list. 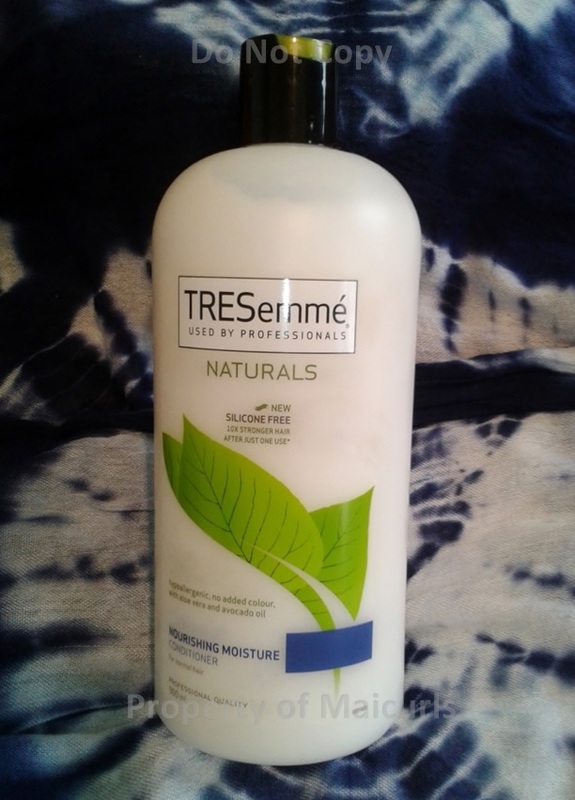 Do you use TRESemmé Naturals? Which one? How do you like it? If you do not like it why? I would love to hear from you! This entry was posted in Co-Washing Natural Hair, Conditioner, Detangling Natural Hair, DIY Deep Conditioner, DIY Leave-In Conditioner, DIY Moisturizing Deep Conditioner and tagged Co-wash, Conditioner, DIY Deep Conditioner, DIY Leave-In Conditioner, Frizz reduction, Moisturizing Conditioner, Tresemme Naturals, Vibrantly Smooth Conditioner on April 23, 2014 by Maicurls.